Happy Back to the Future day! That’s right, today October 21st, 2015 is the day Marty McFly traveled to in Back to the Future II. While many of the predictions made by the movie were clearly meant to be funny and whimsical, it’s still fun to look back to see what Robert Zemekis and the film actually were successful in predicting. So, let us all take a look at the past to see how our present was predicted when it was still long in the future. Still with me? Okay, cool. 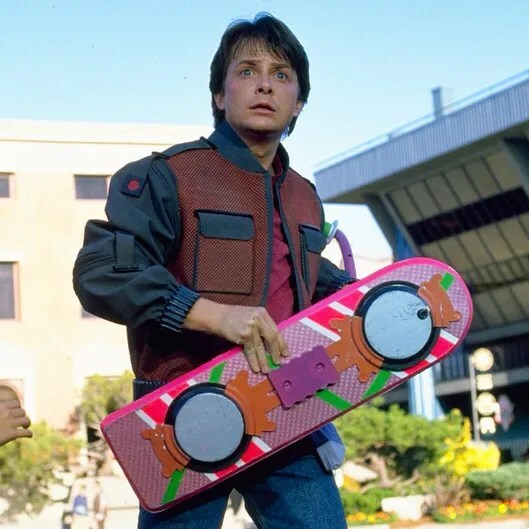 There is much debate on whether or not hoverboards officially exist. But there shouldn’t be because they do! Check it out. The real question is, would they have existed by 2015 (or at all for that matter) if not for the movie Back to the Future?…Mind Blown. This “prediction” came true with the help of Nike designing and releasing the shoes to honor the film this year. Much like the Nike Self Lacing Shoes, Pepsi has decided to honor the film by releasing 6,500 limited edition Pepsi Perfect bottles. They retail for $20.15 which seems like a lot but a far cry from the $50 the movie predicted it would go for in 1989. While the movie puts more of an emphasis on the the idea of the glasses being all the rage with the kids, it did successfully predict that video chat would be a large part of communication in 2015. Basically replace the glasses with phones and Back the the Future nailed this scene. Yup, we do that now. Good call! As of the writing of this post, the Chicago Cubs are currently in the National League Championship Series and very much still have a chance to win the 2015 World Series. Oh, the movie also predicted that Miami would get a pro baseball team which they did in 1993. Well that’s about all I feel like writing about. For more on what Back to the Future II got right, read any other of the thousands of articles that have been written about this all over the internet or watch these videos below. Also feel free to point out some other stuff Back the Future got right in the comments below!